Hey, I'm looking for the episode where Jack uses his Oceanic Golden Pass (ha, that sounds kina dirty) to fly to Singapore, Sydney, etc. every Friday night. I can't find any images in 'Through The Looking Glass,' which is the ep I thought that was in. Didn't it start with him on a plane? And bearded? If not, what episode was that? MERCI. I mean, we did SEE him making all those flights, right? Not just at the airport and all "we have to go back?" My own memory is vague. This is what Lostpedia has to say about it - http://lostpedia.wikia.com/wiki/Golden_pass . I'm pretty sure think Looking Glass opens with Jack on the flight to somewhere, and then ends with his explanation about flying. 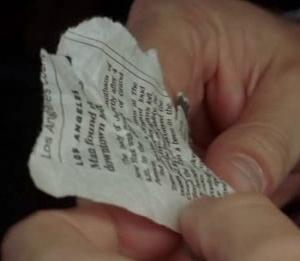 I think the opening scene was framed as a fakeout meant to suggest flight 815 until we see Jack's beard. I could check my DVD if you want. This is from Lostpedia's summary of the episode. "Appearing disheveled and severely depressed, a bearded Jack sits on an airplane. He indicates to the stewardess the empty cup in his hand, and requests "another one of these" but she refuses, telling him they will be landing in 20 minutes. She offers him a newspaper instead. He notices an article in the newspaper and rips it out; it's an obituary. We then see him sitting in a car that is parked on the side of the Sixth Street Bridge, crying while looking at the newspaper clipping." It's strange there is no screencaps. Thank you! I was doubting my own sanity there, LOL. Very weird about the lack of caps! Awesome! The first one is just what I was looking for! He's actually on the plane in TTLG, but I think the pass may be mentioned in 5x01 or 02? It's one of those things that was fanon first and then actually turned up in canon, iirc. I'm also thinking the mention was not associated with visuals of his flying. It's definitely the opening of TTLG. The industry capper, gertiebeth at lost-media.com, seemed to have a bad night and didn't get caps of the opening sequence. I remember because I was looking for caps of the Asian couple sitting behind him that we were supposed to assume were Sun and Jin. Kind of a warmup for LA X.